Confused? It’s understandable. There are so many questions, and an audit can be overwhelming, but The HIPAA E-Tool® has answers. Full alignment between your policies and the HHS HIPAA Audit Protocols takes the guesswork out of your response to an audit. Gain confidence, save time, and answer the audit completely and promptly by using The HIPAA E-Tool®. 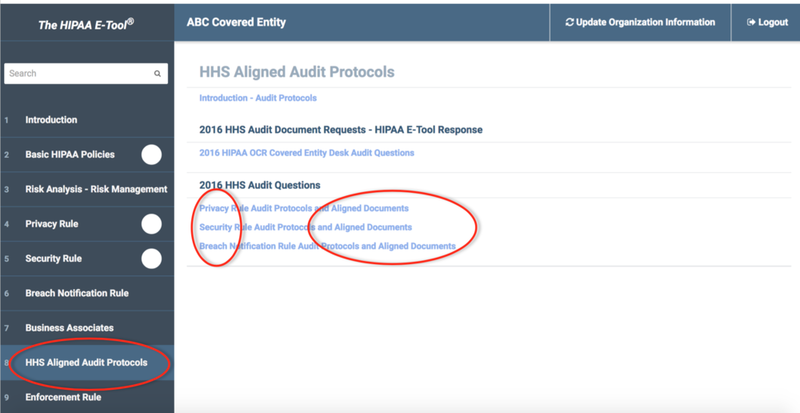 Every HHS HIPAA Audit Protocol (more than 170) is searchable and linked to the exact HIPAA E-Tool forms, policies and procedures needed to comply and pass a Federal compliance audit. Accessible – The HIPAA E-Tool® takes accessibility to an entirely new level – HIPAA Audit Protocols are aligned with a searchable table with live links to your own policies, procedures and forms required to pass an audit. Complete – The HIPAA E-Tool® is the highest quality and the most complete solution – every element of the HIPAA Privacy, Security and Breach Notification Rules is included. Clear – HHS does not publish the Audit Protocols in downloadable .pdf form despite repeated requests from the healthcare industry. So, we did the work, with straightforward alignment between the Audit Protocols and your policies. Saves time and money – the solution is in your hands, saving you from paying legal or consulting fees and spending time trying to untangle the confusion. No other HIPAA compliance consultant, software product, guidance or book has anything close to a comparable feature. Take the fear out of an audit – contact us for a free demonstration and prepare for an A+ response.